In documentul prezentat, Reguli de Kumite in Karate Fudokan - "KUMITE RULES - International Fudokan Karate Rules and Regulations" by World Fudokan Federation, publicat in 2012, am pastrat limba originala in care a fost publicat documentul pentru a transmite cat mai corect nuantele si intelesul acestuia. Kumite competition consists of a match between two persons free sparring without contact. The winner is determined when a technique meets the requirements of Todome-waza (finishing blow), which combines proper physical execution, correct timing, Ma-ai (effective distance), and the designated target zone. If there is no Todome-waza, the winner is the competitor with the higher number of effective techniques or opponent’s penalties. A. The competition area shall have a flat wooden floor or any plastic, semi-shock absorbent surface with necessary measures taken for the safe operations of the match and the prevention of any hazard. B. The size of the Competition Area shall be eight meters square measured from the outer boundary lines. In addition, there shall be an out-of boundary safety area - 1-2 m. This safety area must also conform to the same flat surface and non-hazardous requirements of the Competition Area. C. Two parallel lines, each one-half meter long, shall be drawn on both sides of the center point of the competition area. These lines shall be at adistance of 1.5 meters from the center point. The lines shall be perpendicular to the line where the Shu-shin (Referee) stands at the beginning of the match. The two parallel lines shall be the standing lines for the competitors. D. Placement of the Court Judges, Kan-sa (Arbitrator) and the Court Clerks must be in accordance with the Appendix I.
E. Competition Area must be well ventilated with a recommended room temperature in the approximate range of 18 C0 to 28 C0 with humidity at 40% to 80% and illumination of the competition area is minimum 400 Lux, air velocity from 0 up to 1.5 m/sec. A. Ippon is defined as full point that is awarded for the execution of Todome Waza (finishing blow) technique with correct Timing and Ma-ai (effective distance) at an established body target, with proper contact technique area, where opponent’s offensive capability would be completely neutralized. (a) Maximum energy is delivered to the target by combining the pressure (Kaatsu) reaction from the floor with the line of body momentum. At the final stage of delivery, maximum floor pressure coupled with sharp and total muscular contraction isnecessary to produce maximum shocking power to the target area (Kime). (b) Body stability must be maintained with a strong stance or momentum during the execution of the technique to withstand the reaction shock of impact (Balance). (c) Retention of mental and physical equilibrium immediately after the execution of the technique must be maintained (Zan-shin). (2) Correct timing refers to the opportunistic execution of atechnique at precisely that moment when the opponent’s mental and/or physical capacities are disjointed or in Kyo (Off). - Extreme emotional instability such as fear, anger, anxiety or stupor. - Extreme loss of will, vitality and resolution to fight. - Extreme loss of foresight resulting in disjointed or lapsed attentiveness. - Time period just at the beginning and during technique execution. - Gap in between techniques or break in the continuation of a technique. During Keri (kicking), only by exerting pressure to the floor through the supporting leg at the final stage of leg extension can maximum energy be produced. After delivery of technique, execute a strong pullback of leg to retain strong balance for next movement. In the case of Keri, which does not receive an adequate block, the technique is then considered to have had correct timing. Jo-dan (face area) = Approximately 5 centimeters or less. Chu-dana (stomach area) = Approximately 3 centimeters or less. Chu-dana (stomach area) = Approximately 5 centimeters or less. Angle requirements are approximately 80 to 100 degrees. (5) Distance is slightly off, i.e. too close for effective use of technique. (4) The follow-up technique is not executed continuously and immediately in the case where the opponent either slips and falls oris caused to fall by a preceding technique. (1) Back-leg and back-leg side hand techniques may be Ippon or Waza-ari. This refers to the beginning position of the technique. (2) Front-leg and front-leg side hand techniques are only Waza-ari. In the case of a stance, where both feet are parallel (distance parallel being within the length of a person’s foot), then front-leg rule applies. (1) When the execution of the technique evokes no reaction from the opponent who is caught totally unprepared mentally. (2) When the opponent is physically unable to mount any defensive effort due to induced physical Kyo. Example: balance broken. Strong quick body action (rotation, shifting, lifting, dropping, vibration, body contraction-expansion, etc.) using the floor as base. This force is extended through the arm line. Arm movement is generated from maximum speed of body movement. Rotation of shoulder joint followed by extension of elbow joint further increases the body power. The angle of the extension must be 45° or more. At the final moment of impact, both feet must be firmly in contact with the floor accompanied by astrong, sharp contraction along technique lineduring one strong, complete breathing period with pressure to the floor and total body. Kizami-zuki (front-leg side punch) is only acceptable when target is Jo-dan. Strong, sharp body action (rotation, shifting, lifting, dropping, vibration, body contraction-expansion, etc.) using floor as base. This force is transmitted through the side of the arm. Arm movement is generated from maximum speedof body movement. Rotation of shoulder joint followed by snap action of elbow joint further increases the body power. The angle of the elbow snap must be 45° or more. At final moment of impact, both feet must be firmly in contact with the floor (Kaatsu). At moment of elbow snap, there must be strong, sharp body contraction along technique line during one strong complete breathing period with pressure to the floor and total body contraction. In case of Ura-ken-uchi (BackFist Strike), technique is acceptable also if stance is strongly based on one foot with only the heel of the other foot not in full contact. Uchi is only recognized as point when delivered to Jodan. Chu-dan is not acceptable. Strong, quick body action (rotation, shifting, lifting or dropping) using floor as base. This force is extended through elbow. Arm movement is generated from maximum speed of shoulder joint, which further increases body power. The angle of the rotation of the shoulder joint must be 45° or more. At final moment of impact, both feet must be firmly in contact with the floor accompanied by a strong, sharp contraction along technique line during one strong, complete breathing period with pressure to the floor and total body contraction. Strong, quick body action (pendulum or rotation) using floor as base. This force is extended through knee joint. Hip joint movement generates increased bodypower. Angle of hip joint flexion must be 90° or more. At final moment of impact, support foot must be firmly planted on floor accompanied by strong, sharp body contraction along technique line during one strong, complete breathing period with pressure to the floor and total body contraction. Strong body movement (pendulum or rotation) using floor as base. This force is extended through side of the leg line. Leg movement is generated from maximum speed of body movement and rotation of hip joint and knee-snap action, which increases the body power. The angle of the knee snap action must be 90° or more. At final moment of impact, support foot must be firmly planted on floor. Complete body force is applied with sharp snap-back making very short contact time for increased impact power. The angle of knee snap and snap-back action must be 90° or more. Also, total action should be accomplished in one complete breath. Jump-kick is recognized as a point, only if Keri is delivered during the ascent. Strong body action (pendulum) using floor as base.This force is extended through the straight thrusting line of leg. Leg movement is generated from maximum speed of body movement and rotation of hip joint and knee-thrust action, which increases the body power. The angle of the knee extension must be 90° or more. At final moment of impact, support foot must be firmly planted on floor accompanied by strong, sharp body contraction along technique line during one strong, complete breathing period with pressure to the floor and total contraction with leg and body. At the end of Kime, squeeze back leg to reestablish balance. At time of both knee extensions (thrust) and flexion (squeeze back) the angle of knee action must be 90° or more. Jump-kick is recognized as a point, but Keri line must be same line as ascending (rising) line. Face from eyebrow line to top of ears (not including ears) and around the chin. From above the belt (waist line) to an imaginary line on the upper chest extending from arm pit to arm pit, not to include the side of the body. Only in the case of an opponent who presents a “back position” is it permitted to include the sides of the body and the back as targets so long as these targets do not exceed Chu-dan. A “back position” is defined as a body area (at Chu-dan level) exposed when stance or body position is at least 90 degrees turned from direct frontal presentation to opponent (i.e. facing opponent). This also includes situation where back is exposed as competitor falls to ground. a) The duration of the competition shall be based on “action time” not running time. That is, the time of the match shall be only that time where actual competition action is taking place. Effective time shall commence with the Shu-shin’s announcement of “Hajime” (Begin) or “Tsuzukete Hajime” (Begin to Continue). Effective time shall terminate with the Shu-shin’s announcement of “Yame” (Stop) or “Jo-gai” (Out of Bounds). Effective time shall also stop when the Shu-shin indicates the awarding of a point. However, if the Shu-shin then indicates the cancellation of the awarding of a point, then the effective time shall resume immediately with the cancellation signal. When the athletes themselves and not the Shushin stop the match, effective time shall continue to run until one of the competitors returns to the original position. A technique delivered simultaneously with the time-up signal shall be considered as within the effective time. This includes a point scoring technique, penalty or other rules violation. b) Techniques delivered after the time-up signal are not considered as part of the effective time and are consequently not regarded for scoring or penalizing purposes. This applies even in those cases where the Shu-shin does not announce “Yame” although the time-up signal has been given. c) The time-up signal shall be given by the Timer and shall consist of two short repetitions from a bell, buzzer or gong. Thirty seconds before the time-up signal is given, a warning signal shall be given by the Timer consisting of a single, short sound from a bell, buzzer or gong. A. Jo-gai refers to the crossing of the Court boundary lines and the making off loor contact by any part of the competitor’s body outside of the Court. This violation occurs where the Shu-shin has not announced either “Yame” or the awarding of a point. B. Techniques delivered outside the match area shall be invalid. The exception shall be where the attacking competitor executes a technique completely within the Court area that simultaneously results in the opponent being Jo-gai. A competitor who is Jo-gai twice during a match shall be penalized by having his opponents awarded Waza-ari. If the competitor is Jo-gai twice more in the same individual match, another Waza-ari shall be awarded. (1) If both competitors Jo-gai then the first competitor who is Jo-gai shall be penalized and not the other. If both contestants are simultaneously Jo-gai, there shall be no penalty to either. (2) In the case where a technique is executed and then either or both competitors Jo-gai before the Shu-shin indicates “Yame”, neither competitor shall be penalized as Jo-gai if the technique is subsequently recognized as a point. However, if the technique is not point scoring, then the first competitor to Jo-gai shall be penalized. (3) In the case where a competitor commits an act that may or may not be a violation (such as a body blow) and then either or both competitors are Jo-gai before the Shu-shin announces “Yame” or indicates a violation, neither competitor shall be penalized for that specific Jo-gai if the act is subsequently declared a violation. However, if the act is not found to be a violation, then the first competitor to Jo-gai shall be penalized. (1) In the case where a competitor falls and makes contact with the floor with other than feet but a point scoring technique is not given nor received, a Ten-to penalty shall be applied. A fall may be self-induced or caused by the opponent. (a) If both competitors fall, only the first to do so shall be penalized. In the case where both fall simultaneously, neither competitor shall be penalized. (b) In the case where a technique is executed and then either or both competitors fall before the Shu-shin announces “Yame” or awards a point, neither competitor shall have the Ten-to penalty applied if the technique is subsequently recognized as a point. However, if the technique is not point scoring, then the first competitor to fall shall be penalized. (c) In the case where a competitor falls as a result of an opponent’s attempted Todome-waza that makes any physical contact, a Ten-to penalty shall not be applied against the fallen competitor regardless of whether or not the executed technique is a violation. (d) In the case where a competitor falls and is Jo-gai, boththe Jo-gai penalty and the Ten-to penalty shall be applied. When one competitor is Jo-gai and the other falls, then each receives their respective penalty. (a) The Ten-to penalty competitor moves back to the center of the boundary line with both heels on the line in Shizen-tai (open-leg natural stance). (b) Non-penalized competitor moves forward to face penalized competitor in Shizen-tai position. Both extend hands at arm’s length with tips of fingers touching, and then both return to Shizen-tai positions. The match shall resume from this position. (a) If non-penalized competitor does not move within 5 seconds, then penalty is voided and competitors now resume regular match from original starting positions. (b) If fall occurs and match time is over, with no time for execution of penalty, then non-penalized competitor receives one point (1.0) after penalty confirmation by Fuku-shin (Corner Judges). During penalty match, if time is called, penalty match is over and no points are awarded. (c) Penalized competitor who moves before non-penalized competitor receives Jo-gai penalty. Any movement including fake or foot movement, by non-penalized competitor in starting position is recognized as a move. (d) In order to counter-attack, including use of Keri, penalized competitor must defend (cover, block, or evade, etc.) against attack initiated by non-penalized competitor from starting position. If penalized competitor fails to defend before initiating counter-attack, then counter-attack is not recognized as a point scored and competitor receives Mu-shi penalty. (e) After non-penalized competitor moves from starting position and neither competitor scores a point, the penalty match is voided and the match continues as a regular match. (4) If same competitor falls second time Ten-to penalty will be performed in the corner of competing area and non penalized competitor must be in Kumite Dachi. A. Sweeping techniques applied at the knee joint are expressly prohibited. Blocking and sweeping techniques applied to the upper and lower limbs shall be permitted. M. A wild flurry of attacks or uncontrolled techniques or “blind attacks” (Moda). N. Any other violations of the Competition Rules or other actions not specifically covered here in that interfere with the operation of the competition. A. Violations where the intent is in advertent or accidental shall result in the issuance of Kei-koku. Chui shall automatically result if the same offender commits another Keikoku-type violation during the same match. B. Violations and the situations where the intent to violate is clear but the infraction is not fully executed shall result in a Chui to the offender. Han-soku shall automatically result if the same offender commits another Chui-type violation during the same match. C. When a competitor commits a prohibited act, Han-soku shall be issued. Han-soku shall result in the competitor’s immediate loss of the match. Light injury and/or light body shock. Moderate injury and/or moderate body shock. Heavy injury and/or light body shock. (a) Decisions about the type of contact are made by the Medical Judge according to Fudokan Medical Rules. (b) Skin touch causing no injury and/or body shock will not be penalized. (c) If contact is made after the Shu-shin announces “Yame”, then Chui in case of skin touch or Han-soku if light or heavier contact. However, if the contact is the fault of the recipient or if it is purely accidental, then no violation shall be found. If during competition, a competitor appears to be sick or injured, for example, as a result of contact, then the Medical Judge shall examine that competitor and if found to be feigning, Shi-kkaku (disqualification) shall be declared. If competitors cannot execute techniques as required by the Kumite Rules for a Todome or do not have the ability to execute defense techniques, then Shi-kkaku as Mu-no. A. In the case where a competitor’s ability to continue becomes impaired due to injury or sickness during a match (not caused by the opponent), the competitor’s match shall be terminated by Doctor’s Stop if, following the medical decisions, the impairment period is expected to exceed five minutes. B. A competitor who has been declared the winner of two matches by default during the respective tournament, as a result of the opponent’s contact Han-soku, shall automatically be subject to Doctor’s Stop. Such a competitor shall be deemed ineligible for Medical Approval and consequently cannot continue further Kumite competition in that tournament. The afore mentioned restriction shall not apply in the case where Hansoku is issued against an opponent on the basis of two Chui where only one is the result of contact and the other is not. Any competitor that Ki-ken from a competition shall forfeit the match. In the case of a team match, if any one member Ki-ken from a match then the entire team shall forfeit. A. A competitor's Coach shall have the right to lodge a protest through the respective Court's Kan-sa only on the basis that the operation of match has been in violation of the Competition Rules. B. The Coach cannot protest the Court Judges' Decision or Medical Decision(s) so long as it is based upon the Competition Rules. C. The Coach's protest must be lodged before either competitor leaves the Court. D. In the case where a Coach wishes to protest the operation of the match, the protest must be made to the respective Court's Kan-sa and not directly at the Court Judge(s). E. The Coach's protest must be indicated to the Kan-sa before competitor(s) withdraws from the Court so that the Kan-sa may then direct the Shu-shin to keep the competitors in the Court area. The Kan-sa shall then have the opportunity to listen to the Coach's protest. F. The Coach's protest explanation shall not exceed five minutes. Once a decision has been reached on a specific protest, that decision shall be final. No further protest appeals shall be tolerated. In the case where a Coach persists in contesting the protest decision, the Kan-sa shall have the authority to eject that Coach from the competition area. Kumite competition shall be based on a Single Elimination System (see Appendix). However, by a decision of the corresponding Tournament Controlling Body, the Repechage System may be substituted. Seeding shall be based on competitors from the same country and teams from the same continent. By decision of the Tournament Controlling Body, the winners of the previous tournament bearing the same tournament title-name may be seeded first to fourth place. Placement shall be by random open drawing exclusive of any control by any person. The Kan-sa for each respective Court shall direct the Court Clerks assigned to that Court. A. Karate-gi top must be long enough to reach the groin area but not cover knees. The sleeves must cover the elbow but not cover the wrists. The Karate-gi pants must cover the knees but not the ankles. Neither the sleeves nor pants shall be rolled up. B. The Karate-gi belt must be tied at the waist between the bottom of the rib cage and above the hipbone. The tied ends of the belt shall not be longer than the knees. Aka (red) side competitors wear red belts. C. Women must wear under-shirts under their Karate-gi tops. A. Fist covers must be used so that in case of accidental contact, there is protection against blood borne pathogens. Only official Fudokan approved by the Technical Committee and Medical Committee fist covers shall be used. B. Mouth guard must be used to reduce a chance of injury in case of accidental contact. D. Supportive neoprene or elastic type bandages are not permitted. Subject to Medical Approval by the Fudokan Medical Judge, tape wrapped only twice around is allowed. E. Neither eyeglasses nor contact lenses are permitted. As an exception, soft contact lenses are allowed subject to Medical Approval by the Fudokan Medical Judge. The competition time shall be one and a half minutes. The competitor who first scores Ippon or Awase-waza (2 Wazaari) within the time period shall be declared the winner. The competitors shall meet in three sets of Ippon Sho-bu. The winner of two sets shall be declared as the match winner. Each set shall have a break of thirty seconds between sets. Each set is separate and distinct. Points shall not be cumulative and penalties shall not carry over. Han-soku in any set shall result in the loss of the entire match by the offender. In either the case of Ippon Sho-bu or San-bon Sho-bu where there are insufficient points or set victories to determine a winner, the match winner shall be the competitor with the highest total score as defined under "Scoring". If the scores are the same, a Hiki-wake (Draw) shall be declared. In the case of a Hiki-wake where it is necessary to determine a match winner, then Kettei-sen shall immediately take place without any rest period. The time period for Kettei-sen shall be one and one half minutes. The first competitor to be awarded either Waza-ari or Ippon shall be declared the match winner. There shall be no carry-over whatsoever of any proceeding match points or penalties. If at the end of Kettei-sen, the match winner has still not been determined because of either no points or equal score, then the Court Judges shall be required to decide the winner by Tsu-mae. The following scoring shall be used in the case where neither Ippon nor Awase-waza has been awarded to either competitor at the end of competition time. * No points shall be awarded if Waza-ari has already been awarded. A third Jo-gai can result in points awarded. ** No points shall be awarded if Chui has already been awarded. A third Kei-koku can result in points awarded. *** Point additions for "Effective Technique","Fighting Spirit", and "Fighting Etiquette" shall be awarded only during Kettei-sen involving tied scored at which time Court Judges will meet to decide winner. The size of each Team is three or five members. (a) At competition time, the members from each team shall each compete in one and one half minute’s rounds against the other team's members in the exact order in which they registered. The higher total score between the teams shall determine the winning team. A match will end when one team member is awarded Ippon (including two Waza-ari). (b) In the case of a Ten-to penalty, which is awarded but not executed during the round due to time expiration, the opposing team receives a point. (c) If any team member receives Han-soku, then the entire team shall receive Han-soku. However, if a team member receives Chui or Kei-koku, that penalty shall not be carried over from round to round to another member of the team. (d) If any team member Ki-ken (withdraws) from the competition, then the entire team shall be considered as Kiken, thereby resulting in a forfeit. All match records shall remain valid even if a competitor is subject to a Doctor's Stop. (a) In the case of a tie score between the teams, the outcome shall be determined by a Kettei-sen by Representative. Each team shall select its own respective Representative to compete against the Representative selected by the opposing team. The Representative selected must be chosen from among the actual competing members of each respective team. Alternate team members shall be ineligible. (b) In the Kettei-sen by Representative, the Court Judges must determine the winner on the basis of only what took place during the match. Therefore, the team having the Representative winner shall be declared the victor. (a) Shu-shin shall direct the competitors to their places in the Court area. The competitors shall then bow to Shu-shin, then to one another on the command of the Shu-shin who shall say the word, “Rei” (Bow). The competitors shall then go into the Shizen-tai position. (b) The start of the competition is called the “Shobu Ippon Hajime”. (c) To temporarily stop the competition, the Shu-shin shall use the word “Yame” or “Jo-gai” and signal accordingly. At these times, the competitors shall return to their starting places and assume the Shizen-tai position. The competition shall resume upon the order of the Shushin, which is called “Tsuzukete-Hajime”. (d) All pronouncements, including the declaration of the match winner, the awarding of points, notice of violations and penalties, shall be made by the Shu-shin from the designated place in the Competition Area. Each competitor shall acknowledge said pronouncements by lightly bowing to the Shu-shin, regardless of which athlete is the subject of the pronouncement. (e) When the match is completed, each athlete shall bow to the other on the command of the Shu-shin who shall say “Rei”. (f) During the match, when the Timer gives the signal of one ring of bell or gong that there are 30 seconds remaining before the end of the match, the Shu-shin shall give notice of “Shibaraku” (30 seconds remaining) to both competitors. However, the match does not stop upon the notice of Shibaraku. (g) At the end of the match, the Timer shall signal by strikes on the bell of gong that “time is up”. At that moment, the Shu-shin shall stop the match by announcing “Yame”. The competitors shall return to their starting positions. The end of the match, which is called “Sore-made” (end of the match), shall then be announced by the Shu-shin while simultaneously giving the Sore-made signal of the right hand stretched straight ahead (parallel to the floor) with palm facing forward. The Shu-shin shall then ask for the score from the Kan-sa. As soon as this is known, the Shu-shin shall announce the score and award the match to the winner. In the case of a tie score, then the Shu-shin shall announce “Hiki-wake”. In the case of Hiki-wake, the competitors shall remain in the Competition Area in the Shizen-tai position. (h) In the case of the Kettei-sen, the notice shall be given by the Shu-shin as “Kettei-sen Hajime”. The Kettei-sen shall use the same competition sequence as that given in (b) through (g) as above (Regular Match) except that if either competitor receives Waza-ari or Ippon, then that competitor shall be declared the match winner. (i) If at the end of Kettei-sen the score is still tied with no points having been awarded, then the Shu-shin shall call a Court Judges Meeting. The Court Judges Meeting shall then decide Tsu-mae match. Shu-shin shall assume Seiza position with Fuku-shins one meter outside the competition line (opposite from the main seating area) and announce Tsu-mae (Decision). The announcement shall involve the declaration of Hajime. The Shu-shin shall then step into the Competition Area and announce the winner of the match. (j) During a Court Judges Meeting during a match, the competitors shall face away from each other from the “Competitor’s Position” and assume Sei-za (formal floor sitting position) until the end of the meeting. In the event that the meeting exceeds one minute in duration, the Shushin shall instruct the competitors to return to their respective competitor’s seating areas. (k) As soon as the results are announced by the Shu-shin the competitors shall bow to one another on the Shu-shin’s command to “Rei”. They shall leave the competition area. Other than the following, the sequence for team matches shall be the same as for individual matches. (a) Before each team match, the team members shall line up at the opposite boundary lines (right and left of the main front seating area). On the Shu-shin’s command of “Rei”, each side shall bow to the other. After bowing, the competitors shall return to their seats to wait. (b) Each match shall begin with the Shu-shin’s announcement of “Hajime”. Each match shall run for one and half minute or until one side scores Ippon (including 2 Waza-ari). (c) At the end of each match, the Shu-shin shall declare “soremade” and the next match shall follow immediately. (d) When the final team competitors have completed their match, then the procedure followed shall be the same as in an Individual Match. The Shu-shin shall then direct the competitors to line up as in (a) above. The winning team shall then be declared by the Shu-shin. Following this declaration, on the Shu-shin’s command of “Rei”, the competitors shall bow to one another and then depart from the Competition Area. In the case of a tie score, the Shu-shin shall announce Hikiwake. The team shall not line up. Instead, the Shu-shin shall ask each team for a Representative. (e) The Kettei-sen by Representative shall follow immediately. The Kettei-sen by Representative procedure shall be same as for Individual Kettei-sen. The procedure for the declaration of the winning team shall be the same as given in (d) above. The Chief Judge shall make all judging assignments and corner placements. Only the Chief Judge may make changes of assignment of placement. However, the Kan-sa at each Court may appeal to the Chief Judge for consideration of changes of assignments of placement. The Chief Judge is empowered to delegate authority to an Assistant Chief Judge assigned to a separate Court. A. The Shu-shin must possess a whistle. B. The Fuku-shin must each possess a whistle and a set of Aka (red) and Shiro (white) flags. A. A Kan-sa, assigned by the Chief Judge, shall be present at each Court. B. A Kan-sa must possess a whistle and a set of Aka (red) and Shiro (white) flags. (1) To arbitrate the operation of the matches and immediately seek to correct through the Shu-shin any discovered violations of the Competition Rules. (2) To respond to any questions from the Shu-shin as they relate to the operation of the competition. (3) To maintain a record of the competition so as to answer any inquiries from the Shu-shin and to substantiate the work of the Recorder. (4) To monitor the competition times and to correct any discrepancies by immediately notifying the Shu-shin. In the case where the time expires but the competition in advertently continues, then the Kan-sa must immediately notify the Shu-shin as well as the Recorder with an order to stop. The Recorder shall the void all records made after the order to stop had been given. (5) When monitoring the competition, if the Kan-sa believes there is favoritism or unfairness on the part of any Judge(s), the Kan-sa shall request the Shu-shin to issue a warning to the offending Judge(s). If after the Shu-shin’s warning, the unfairness continues uncorrected, then the Kan-sa may appeal to the Chief Judge to have the offending Judge(s) removed. (6) The Kan-sa shall weigh the merits per the Competition Rules and then decide whether or not to order corrections through the Shushin of any Coach’s protest received against the Competition Rules. In the case where a Court Judge has already made a decision subsequently discovered to be against the Competition Rules, then the Kan-sa shall order the Shu-shin to ask for a Prejudgment. Competition decisions shall be based upon a majority vote of the Court Judges. The Shu-shin shall have two votes and the Fuku-shin shall each have one vote. In case of a tie, the Fuku-shin majority shall determine the decision. Exceptions to the foregoing shall be in the case of penalties, violations and points where a Fukushin does not observe the action in question. Such a Fuku-shin shall have no part in the decision-making. The Kan-sa, having no voting rights, shall not participate in any competition judging decisions. Decisions involving significant disagreement or controversy shall be appealed by the Kan-sa to the Chief Judge who shall, in turn, request a Jury Decision. The Jury Decision shall be final and irrevocable. The Shu-shin shall also be responsible for monitoring complete condition of the competition area (flat surface - air velocity, ambient temperature, light - illumination, noise etc). D. When the Shu-shin is notified by the Kan-sa to call a Court Judges’ Meeting. E. In case of any emergency. The Court Judges Meeting must be held around the seating area of the Kan-sa. The Kan-sa replies to Judges’ questions concerning Rules of Competition. Court Judges Meetings shall not be held for point decisions unless the matter concerns controversy over the Competition Rule(s). O. When any emergency situation arises. A. During match time, the Shu-shin shall recognize a point, either Ippon or Waza-ari accordingly. The match shall then be stopped where upon the competitors and the Shu-shin shall return to their original positions. The Shu-shin shall then point with an open hand toward the competitor to be awarded either Ippon or Waza-ari. If the indication is Ippon, the Shushin shall point toward the scoring competitor’s face. If the indication is Waza-ari, the Shu-shin shall point toward the scoring competitor’s waist. The Shu-shin shall do this so as to obtain the Fuku-shin confirmation of the point to be recognized. The Fuku-shin must then show their own intentions. If with the Shu-shin voting, a majority vote is obtained, then the point shall be declared. If, on the other hand, there is a majority against the point indicated or there is a tie, then the point shall either be canceled or changed in accordance with the wishes of the majority. B. During match time, in the case where the Shu-shin fails to see an executed technique and consequently does not indicate a point other than Teki-kaku, if two or more Fuku-shin indicates a point, then the Shu-shin must stop the match and obtain point indication confirmation from each Fuku-shin. This is done by the Shu-shin pointing and index finger at each Fuku-shin. If the point is confirmed by the majority, then the Shu-shin must award the point. If there is insufficient confirmation, then the Shu-shin shall cancel the point declaring Tora-nai (Void). C. If Fuku-shin is unable to see target, then he cannot indicate a scoring point. However, if the Fuku-shin recognizes correct technique, position, and timing as sufficient for a point, then Fuku-shin is able to indicate Teki-kaku by signaling simultaneously: a sharp whistle; the indicating flag movement same as Ippon or Waza-ari; other flag is parallel to floor, covering eyes. This indication of Teki-kaku may be calculated as a point if the Shu-shin confirms that the technique was executed to the target. However, if the Shu-shin finds that the technique was not executed properly to the target (for instance block, cover, bad angle, etc.) then the Shu-shin is able to disregard any number of Teki-kaku indications by the Fuku-shin. D. In the case of a difficult judgment, the Shu-shin may defer to each Fukushin requesting their opinion and rationale prior to declaring the judgment. The procedure for doing this shall be for the Shu-shin to stand at the original position and then blow one short, sharp whistle. The Shu-shin shall then point with an index finger at the Fuku-shin needed to form a judgment decision. The Fuku-shin so selected shall then indicate their rationale and judgment to the Shu-shin. E. If following the majority judgment of the Fuku-shin, the Shu-shin is in disagreement, and then the Shu-shin may request a "Sai-shinpan" (Prejudgment) from the Fuku-shin. The procedure for doing this shall be for the Shu-shin to step outside the court and then request a Sai-shinpan. The signal for Sai-shinpan shall be several short, sharp whistles followed by the Shu-shin touching the left chest area with the right palm. The Shu-shin shall then indicate an explanation followed by the judgment. The Shu-shin shall then make the final signal gesture for a Sai-shinpan by blowing one long whistle followed by a single, short whistle. At that moment, all Fuku-shin must simultaneously indicate their respective re-judgments. The Sai-shinpan decision shall be final. A. The Shu-shin shall indicate Jo-gai by pointing an index finger at the competitor and then gesturing with the same index finger at the Court boundary line where the competitor was Jo-gai while saying “Jo-gai”. These signals shall serve as the Shu-shin's notice to the Fuku-shin for confirmation of the Jo-gai Penalty judgment. The Fuku-shin must indicate accordingly their respective judgment. If there is a majority confirming the Jo-gai Penalty judgment, the Shu-shin shall then use the same index finger, this time pointed upward and held at chest-high level while saying “Ikkai” to give notice of the competitor's first Jo-gai Penalty judgment. If the same competitor is subsequently Jo-gai, the procedure to be followed shall be the same except that the last signal gesture shall be the index and middle fingers pointed upward, at chest-high level while saying “Nikai” to give notice of the competitor's second Jo-gai Penalty judgment. During an individual match, the Shu-shin shall then declare Waza-ari on behalf of the competitor's opponent. B. The confirmation and Sai-shinpan of Jo-gai penalty procedures shall be the same as those for "Procedures for Point Decisions". A. The Shu-shin shall indicate the Ten-to Penalty when the competitor falls. The procedure for doing this shall be the Shu-shin first pointing with an index finger at the Ten-to competitor; second, making one large complete circular motion with the same index finger and saying "Ten-to" and then third, pointing down toward the center of the court with the same index finger. These signals shall serve as the Shu-shin's indication to the Fuku-shin for confirmation of the Ten-to Penalty judgment. The Fuku-shin must accordingly indicate their respective judgments. If there is a majority confirming the Ten-to Penalty judgment, the Shu-shin shall give notice of the judgment by using the same index finger to motion the penalized Ten-to competitor straight back to the center of the boundary line with the vocal command of "Sagaru" (move back). Then Shu-shin instructs non-penalized competitor to move forward to face the penalized competitor and both extend arms, touching tips of fingers together. Shu-shin indicates "Tsuzukete, Hajime" which begins penalty match. (1) The confirmation and Sai-shin-pan of the Ten-to penalty procedures shall be the same as those for “Procedures for Point Decisions” (seeArticle 4.5-E). (2) If competitor falls at the same time match is over, Shu-shin gives opponent one point (1.0) after confirming Ten-to penalty with Fuku-shin. (1) Ten-to penalty match continues until match is interrupted. (2) If competitor(s) does not move within five seconds after match begins, Shu-shin stops match and Ten-to penalty match is completed. At the start of the penalty match (Hajime) the Kan-sa shall signal the timekeeper to begin a 5 second count. At the end of the count the timekeeper sounds a bell or gong. (3) For all declarations of points, notice of penalties, or any indication of penalty match, Shu-shin orders both competitors to return to original positions in center of court. (1) Penalized competitor should stay in corner of competition area in Shizen-tai position, non penalized competition should be in Kamae position and star his attack after Shu-shin command Tsuzekete - Hajime. A. If the Shu-shin finds that a very light or minor violation has occurred or the potential for violation, then the Shu-shin shall have the right to issue and informal warning. In this case, Shu-shin must call both competitors, then give Informal Warning to faulty party(s), but issues no penalty. B. If the Shu-shin finds a light violation or that the same competitor who had previously received the Informal Warning again commits the same violation, then the Shu-shin shall have the authority to give notice of Keikoku. The Shu-shin’s signal for Kei-koku shall be a raised index finger toward violation side. The reason shall be given by the Shu-shin by the appropriate Signals. The Shu-shin shall demonstrate the intention of giving Kei-koku to the Fuku-shin by showing a raised index finger to confirm each Fuku-shin, and then give sanction. If two or more Fuku-shin are not opposed, then Kei-koku will be issued. The issuance of two Kei koku violations during the same match by the same competitor shall automatically result in a Chui. In this case, a Court Judges Meeting shall not be required. C. If the Shu-shin finds a violation or if one or more Fuku-shin signals a violation, the Shu-shin must then immediately stop the match and from the original position, call a Court Judges Meeting to render a judgment on the violation. D. In the case of a contact violation, the Shu-shin shall first call for an examination by the Medical Judge with the Tournament Doctor who shall then, based on a Medical Decision identify the degree of contact, loss of functional capacity – functional impairment. A Court Judges’ Meeting shall then be held to render a judgment on the violation based on the Medical Decision and the Court Judges assessment of circumstances based on rules. E. If the Court Judges decide that a violation has been committed, then the Shu-shin shall, from the original position, give notice of the type of violation. In the case of a contact violation, the Shu-shin shall indicate the violation with the proper hand signal and then issue the penalty. If the Shu-shin determines that a competitor has sustained an injury or sickness, or if the Medical Judge signals such through Kan-sa, or if one or more Fuku-shin signals that such may have occurred, then the Shu-shin must immediately stop the match and call for the Medical Judge and Tournament Director. The Shu-shin shall request a Medical Decision only given by Medical Judge whereupon a Court Judges Meeting shall be conducted. If the Medical Decision is a Doctor’s Stop then the Shu-shin shall report this at the Court Judges Meeting. After related matters have been discussed, then the Court Judges decision shall be announced through the Court Announcer and the competitor receiving the Doctor’s Stop shall be removed from the competition area. When an injury or sickness occurs and the Shu-shin stops the match, it shall not be necessary for the competitors to return to the original position since the ease and comfort of the sick or injured competitor must take precedence. If the Medical Decision made by Medical Judge so orders, the sick or injured competitor must be moved immediately for medical treatment even prior to the Court Judges Meeting and decision. At the signal from the Kan-sa, the timekeeper begins to count at the start of the treatment of injured competitor. After 5 minutes, the timekeeper shall sound a bell or gong. At this time the Medical Judge indicates “Doctor’s Stop”. The Medical Judge and/or the treatment doctor have the right to extend this time under special conditions. A. In the case when the Kan-sa wishes to intervene during a match, notice shall be given by the holding of a red flag overhead and simultaneously blowing several sharp whistles. These actions by the Kan-sa shall constitute an order to stop the match and for the Shu-shin to approach the Kan-sa’s seat. B. If the Kan-sa believes that an irregularity or questionable issue has arisen during the operation of the match, a Court Judges Meeting shall be requested through the Shu-shin. Upon hearing the Court Judges’ explanations, the Kan-sa shall then give the appropriate direction to the pertinent Court Judge(s). If the matter does not have an immediate solution, then the Kan-sa shall ask for a Jury Decision through the Chief Judge. Upon hearing the outcome of the Jury Decision, the Kan-sa shall then give the appropriate direction to the pertinent Court Judge(s) in accordance with the Jury Decision. D. When the Medical Judge notifies Kan-sa of a Judge’s physical debilitation. Since Hiki-wake does not apply in Kettei-sen, the Shu-shin shall call for a Court Judges’ Meeting in order to make the decision. At this meeting, the Court Judges must make a Tsu-mae decision for either Aka or Shiro. 1. When a Fuku-shin signals (by flags or whistle) indicating that an effective technique has been delivered by one of the competitors, the Shu-shin may ignore the signal and continue with the match. However, when two or more Judges have signaled likewise, the Shu-shin must suspend the match. The Shu-shin shall then listen to their opinions and then render a decision on the match. However, in the case of an emergency, a violation or a Jo-gai signaled by even one Fuku-shin, then the Shu-shin is required to stop the match. 2. Only the Shu-shin shall have the authority to suspend or terminate the match. No one other than the Shu-shin shall be permitted to halt the match arbitrarily. An attack, even if effective, delivered after an order to stop has been given, shall not be recognized nor shall it constitute a basis for decision. 3. The authority of the respective Court’s Kan-san of the match shall include supervision, inspection, and direction of the Timer and the Recorder. Records kept at the match shall become the official record subject to the approval of the respective Court’s Kan-sa. A. The Shu-shin and the Judges must conduct themselves impartially and fairly. B. They must comport themselves with dignity and self-control. C. They must concentrate their full attention on the match so as to judge every action of the competitors correctly. D. They must not converse with anyone during the match. The Kansa and Fuku-shin may speak only through the Shu-shin. The Fukushin may not converse with one another. 5. Other than Jo-gai and Ten-to penalties, the following procedures apply to penalties. C. Fu-kei (Bad Attitude), Poor Etiquette, or Disruptive Self- Promotion. D. Other than A, B, C as above, without informal warning or Kei-koku the penalty is decided by Court Judges Meeting. Regulamentul de karate "KUMITE RULES - International Fudokan Karate Rules and Regulations" by World Fudokan Federation, publicat in 2012, poate fi vizualizat sau descarcat in format PDF accesand acest link. 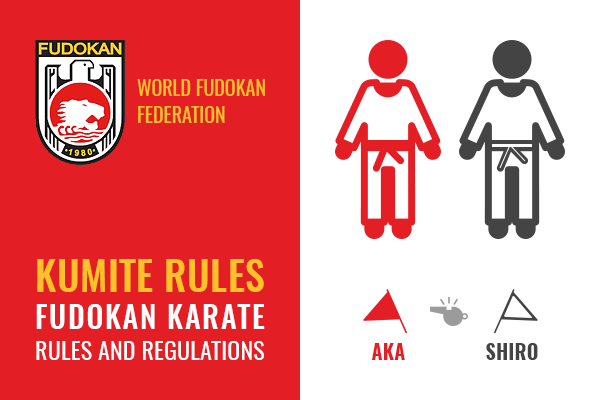 The Karate Fudokan Kata Rules according to World Fudokan Federation can be viewed as PDF accessing accessing this link or you can order the book from World Fudokan Federation Shop.